OOC: sorry I forgot the quotations and italics! "Nice to meet you Jackson Greystone. My name is Nilparin, but you can call me Nil." Extending his hands towards Jackson. A slight smile tugs at the corner of Harukai’s mouth at Jackson’s comment, and he spares a quick glance towards Nilaprin. ”As are we all, compared to you,” Harukai replies, also in Celestial. "Let's all calm down I'm sure Grunden just got a little lost afterall Neverwinter is a big city"
"Thank you, why don't we all introduce ourselves while we wait? 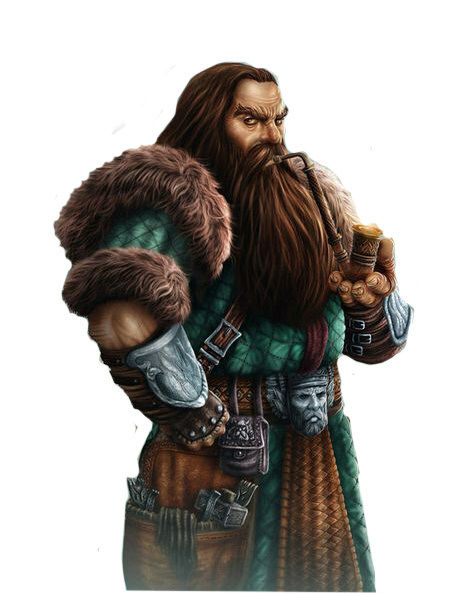 I'll go first my name is Nilparin nice to meet you all"
"I am Koren Delmirev, may the blessing of the great mother be upon you"
"I see.. my skills are in the ways of magic"
"My skills are in the way of music and sword"
The door to the inn suddenly opens and a dwarf, dressed in green clothing with fur accents, comes walking in accompanied by a human dressed in heavy plate armor and armed with a long sword. Looking around the room, his eyes find your group and a large smile flashes across his face, partially obscured by his bushy brown beard. He walks to the table, puffing his long pipe. He yells to the bar "Hey! A round of drinks for my friends!" He sees Jackson and says "Hello old friend, I forget that you do not partake in drink, I am sure the rest of your new friends will assist you with drinking it." "Ah Grunden, I'll for sure partake in your generosity and who is your friend you have brought?" 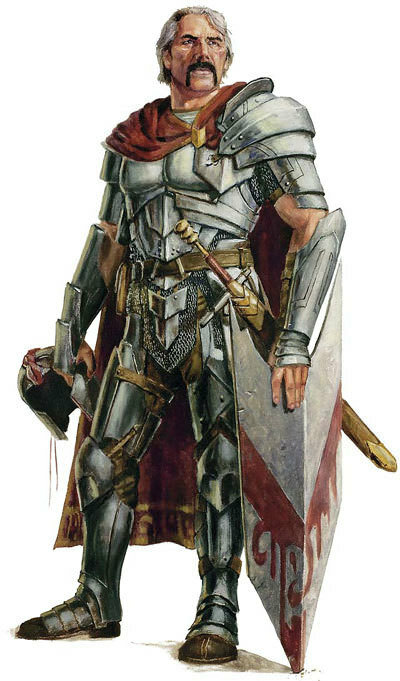 Gundren begins "Hello friends, it is my pleasure to introduce Sildar Hallwinter. Sildar is an associate of mine and is assisting me in some business." Sildar nods to the group. Gundren continues "I have called you together for a business proposal. I am needing some supplies delivered to a small mining town to the south known as Phandalin. My brothers and I have a business venture there and the success of that venture depends heavily on these supplies making it to the supply house in the town. I will pay each of your group 10 gold pieces each to deliver these supplies to the supply house in Phandalin. 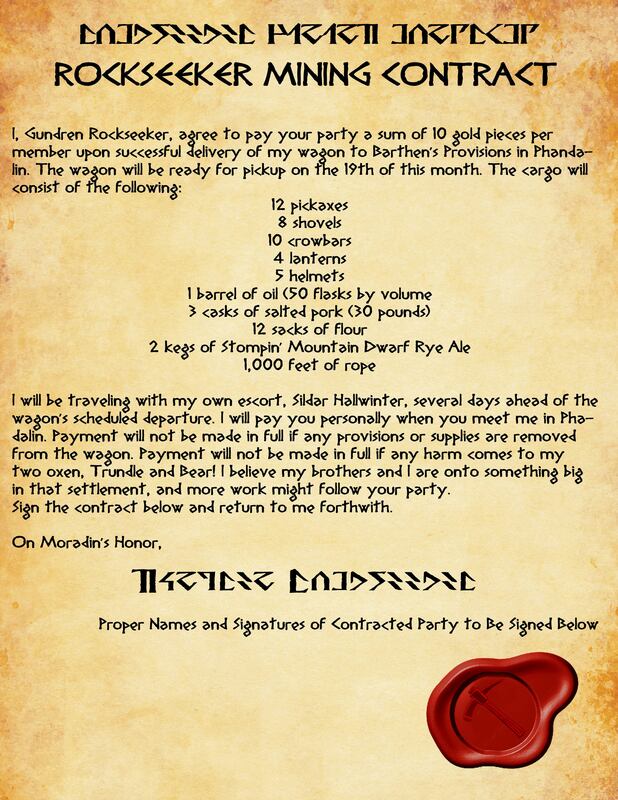 Your payment will come from the owner of Barthen’s Provisions upon successful delivery of these supplies. Simply hand him this contract." Gundren places his contract on the table. "Nice to meet you Sildar" Nilparin looks over the contract "Is there anything else we should know?" We'll assume that by this time, Jackson has already shaken Nil's hand and introduced himself to Koren. "Ahh Gundren, it is very nice to see you -- no matter the whereabouts or circumstances. And to you, Sildar, I bid you greetings. By the looks of you, I'd guess you and I are around the same age. It's an absolute pleasure to be in the midst of another veteran," he says, standing up out of his seat to greet both of them. "While you and I are not familiar in any way, I trust you to keep poor Gundren here safe. Tyr knows -- he's not as agile as he once was!" He looks the contract over, nods, then motions towards the group sitting around the table. "As for us lot, we've all been getting acquainted -- though the Tabaxi...has yet to say a word. I will add, though, that while I certainly agree to everything on this contract, I can't guarantee all 30 pounds of your salted pork will get there safely!" he says laughing, almost wheezing. He then sits back down and motions to the barkeep. "Herbal tea, if you have it. By Tyr, this chain mail will be the death of me." Sildar bows slightly to Jackson "the pleasure is mine. Gundren tells me many good things about you. I am glad to make your acquaintance." To Jackson "My friend, it is always good to see you and fate smiles well upon us today as well." To Nilparin "The road to Phandalin is rumored to harbor some...shady individuals. Sildar and I have made the trip between here and Phandalin on horseback several times without issue, but the combined value of the cart and supplies, along with the project they will be used on cause me to take extra precautions on their travels. For this reason, I have hired each of you as...insurance, to ensure the delivery is made. It is of the utmost importance that it arrives safely and I have received reference that each of you is skilled enough to make sure that happens."